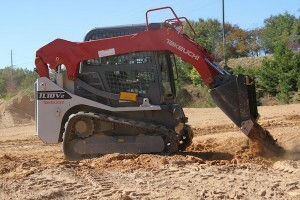 Takeuchi-US, introduced two new track loaders. The TL10V2 and TL12R2 both are U.S. Environmental Protection Agency Final Tier 4 emission compliant and come standard with Takeuchi’s new telematics system, Takeuchi Fleet Management. 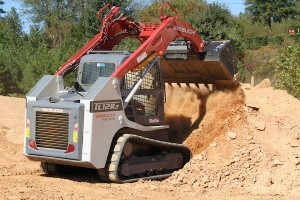 The TL10V2 is the second vertical lift track loader in the Takeuchi lineup, joining the larger TL12V2. At 10,130 pounds, the TL10V2 features a tipping load of 7,205 pounds, bucket breakout force of 6,520 pounds, and lift arm breakout force of 5,400 pounds. Additionally, it has a maximum hinge pin height of 10 feet 4.8 inches, dump height fully raised of 7 feet 11.9 inches and dump reach of 3 feet 1.4 inches. The TL10V2 is powered by a Kubota 3.3-liter diesel engine that produces 74.3 hp. The TL12R2 radial replaces the TL12 and features an operating weight of 12,530 pounds. With a tipping load of 8,629 pounds, the TL12R2 features a bucket breakout force of 8,210 pounds, has a maximum hinge pin height of 10 feet 6 inches, a dump height of 7 feet 10.5 inches, and dump reach of 3 feet 1.8 inches. It is powered by a Kubota 3.8-liter diesel engine that produces 111.3 hp and, similar to the TL12V2, the TL12R2’s operator station has been redesigned and is 3 inches wider than the TL12.